For garden enthusiasts, owning a variety of garden tools and equipment is a must to keep your lawn. Pruning shears, lawn mower, and rakes are just examples of essential gardening tools along with best electric pole saw. Today, we are going to review the top 9 best-selling pole saws in the market to help you choose the right one for you. The following are the most durable, efficient, and affordable pole saws every gardener must have. 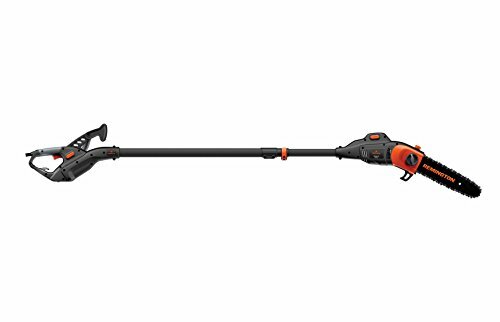 First on the list is the Remington 2-in-1 pole saw for your regular gardening needs. By merely removing the saw from the shaft, you can turn your pole saw into a chainsaw in just a matter of seconds. Best of all, it does not require any tools at all! This pole saw is made of two aluminum booms that can reach up to ten feet, allowing you to reach higher branches. Considering the height of the operator, cutting branches up to 15 feet is a breeze. This pole saw utilizes an 8-amp electric motor for increased productivity. It also features an anti-rotation shaft and non-slip grip for your convenience. Make sure that the saw chain is loosened up otherwise the bar and chain oil will escape from the unit. This budget-friendly pole saw from Sun Joe is a bang for the buck! For cutting branches and twigs, this pole saw is ideal for you. The unit only weighs seven pounds, making it easy to use. Its telescoping pole is extendable up to 8.7 feet and up to 15 feet for overhead reach. It also utilizes a heavy-duty 6.5-amp motor that can cut the branches for up to 7.5 inches thick. This pole saw also features an 8-inch Oregon cutting bar and chain with automatic lubrication. The oil tank has a capacity of 2.7 ounces. To ensure your safety, this pole saw has been approved by CSA. Buyers can enjoy a full two-year warranty from the manufacturer upon purchase of the product. In just a push of the button, you can automatically start the pole saw. It also has a safety switch to prevent accidents. 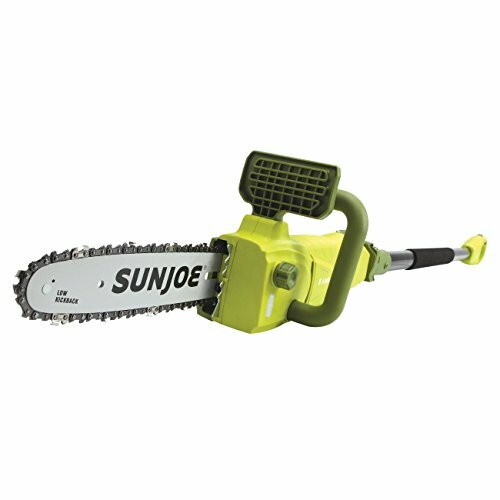 Another product from Sun Joe is this 8-amp electric pole chainsaw. This 2-in-1 pole saw is a must for every gardener when it comes to cutting thick or thin branches. The shaft of this saw can extend up to 8.6 feet, not considering the height of the operator. It is powered by an 8-amp motor that can cut branches up to 7.5 inches thick. This pole saw also has an 8-inch Oregon cutting bar and chain with automatic lubrication for your convenience when using the product. You can also convert this pole saw into a hand-held chainsaw by removing the shaft. In that way, you’ll be able to handle heavy outdoor chores with ease. Best of all, you don’t need to burn a hole in your pocket to do so. 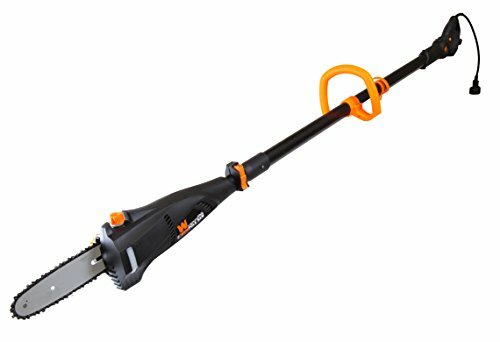 If you have extra budget, you might want to take a look at this Sun Joe multi-angle telescopic electric pole chainsaw. 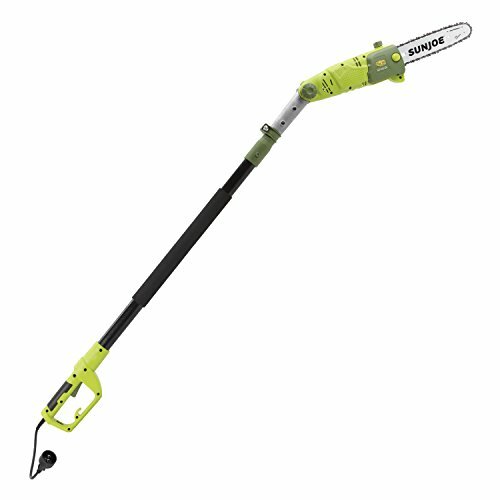 It is ideal for cutting overhanging branches in your lawn. Thanks to its extendable pole of up to 7.2 feet, you can have 14 feet of overhead reach with this pole saw. What we like about this product is its multi-angle head that you can adjust from 0-degree to 30-degree. It is powered by an 8-amp motor that can penetrate a 9.5-inch thick branch. Similar to other products from Sun Joe, this pole saw also features a 10-inch Oregon cutting bar and chain with automatic lubrication. Using this product is a breeze. All you need to is push the button, and it’s ready to go. The Remington pole saw offers 2-in-1 functionality, a pole saw and a chainsaw in just one unit! Just press the quick release button, and you can convert your pole saw into a handheld chainsaw in just a few seconds. Switching the unit does not require any tools at all. 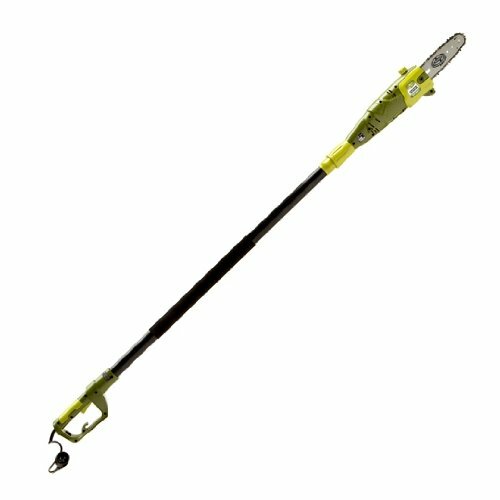 This pole saw is built with an extendable shaft that can read up to 10 feet for reaching overhead branches. It also includes a branch hook that can help in aiding hung-up limbs. Thanks to its 8-amp inline electric motor, increasing your productivity by a more extended hour of use. You can adjust the length of the pole with ease thanks to its telescoping design with flip and lock clamps. This pole saw is ideal for cutting thick branches in a varying height of the trees. Now you can prune in ease and comfort thanks to its anti-rotation shaft and non-slip grip, allowing you to achieve maximum comfort when using the product. If you like the Remington products, you will also like this Remington 8-amp electric 2-in-1 pole saw and chainsaw. Similar to the previous product, you can also convert this pole saw into a chainsaw by merely detaching the saw from the pole with no tools required. This pole saw is run by a powerful 8-amp electric motor that will instantly drive the chain once you press the button. You can adjust the length of the pole for overhanging branches and reach higher areas. Also, similar to other products from Remington, this pole saw features a non-slip grip and an anti-rotation pole that can maintain stability while you’re pruning branches. The WEN electric telescoping pole saw is just what you need for your beautifying your lawn. It has a telescoping pole that you can adjust from 6.5 feet to 9.5 feet and up to 13.5 feet for an excellent overhead reach. It is powered by a 6.5-amp motor that can rotate the Oregon chain up to 2165 feet per minute. This pole saw only weighs around 8 pounds, making it easy for you to use the product. The chain adjustment of this pole saw requires no tools at all. Its emission-free operation is also an advantage to the users. The package includes an 8-inch Oregon saw chain, adjustable center handle, scabbard, and a shoulder strap. Best of all, it is one of the cheapest pole saws on the list! 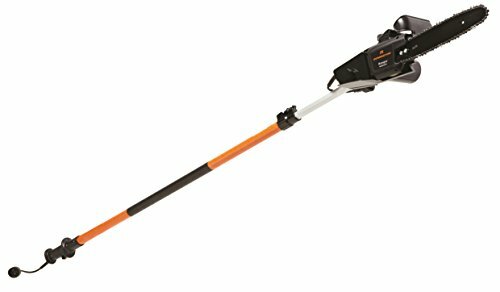 The Worx electric pole saw is ideal for customers who wanted to keep their pole saw for a lifetime because of its superior durability. It has a patented auto-tension chain system for an extended bar and chain life. This pole saw runs an 8-amp motor for consistent and heavy-duty performance. The capacity of its oil tank is 120 ml. It also has a rotatable working handle that makes it easier for you to prune branches. You can install the 8-feet extension pool without any tools at all. Thanks to its compact and lightweight design, using this pole saw is easy and hassle-free. 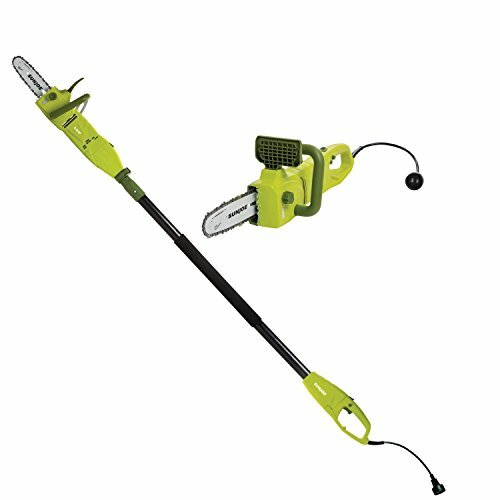 For our last product, we have the Sun Joe electric convertible pole/chainsaw. This 2-in-1 tool is a must-have for every gardener. You can use this as a handheld chainsaw or a pole chainsaw however you want. This pole saw is suitable for cutting thick branches and the likes. Its telescoping pole can extend up to 8.8 feet, and it is powered by an 8-amp motor that can penetrate a 7-inch thick branch. This pole saw had been approved by the CSA. It comes with a full two-year warranty upon purchase of the product.